Check back frequently as new information will be added often. National Members $100 and Local Members $150. 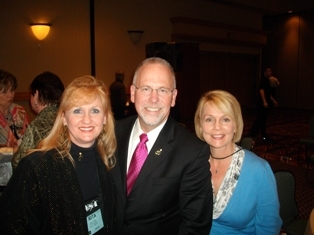 Our Immediate Past National President, Phil Van Hooser with Rita and his lovely wife, Susan. SO glad you stopped by. Our members not only want to be their best, but they want to help others become their best as well...which is the spirit of Cavett. As you may well know, Zig Ziglar says that you will get what you want if you will help enough other people get what they want. That is the spirit of our Alabama Chapter. 2009-2010 was a tough year for the Alabama Chapter, but we have pulled it out...and very well, I might add. There are those founding members of our chapter who have stood with me through this difficult time and I want to publicly thank them...Bryan Townsend, Darlene Real Higginbotham, Pete Land and Kirt Kilpatrick...and a special thanks to Gary Minor, Lou Heckler and Phil Van Hooser for all their kind assistance as well. A big congratulations to Terry J. van der Werff, NSA Member of the Year for Alabama! Terry will move up to president when my term is finished in 2012. We are honored to have such knowledge and experience working for us. We have a Board of Directors in place that will not only get things done, but will take our chapter and FLY!! I don’t just believe it…I know it! I know most of these folks personally and they are the cream of the crop! We have some very wonderful things in store for this year. We will be meeting every month instead of every other month and we will rotate between Saturday morning meetings, to luncheon meetings, to evening meetings, with some added workshops as well. If you’ve ever had friends that were interested in becoming dynamic speakers, you have a resource to share with them that will absolutely get them there!...Alabama NSA! You will have the opportunity to get "up close and personal" with some of the nation's best. We are launching a massive marketing program that will put NSA Alabama on the map and mind of every speaker in Alabama. We are also building a new directory right here on the website so you can become familiar with your fellow speakers and freely contact them for relationship building, which is my prime directive. Don't put membership off any longer. Today is the day. Now is the time. Where will you be this time next year? Make it a year to count! we make the pie bigger."